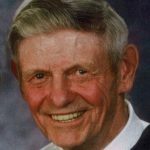 Harold H. Kaiser, 88, of Waverly, Iowa passed away on Friday, February 19, 2016 at the Bartels Lutheran Retirement Community in Waverly, Iowa. Harold H. Kaiser was born on April 8, 1927, the son of Herbert and Ella (Wilkens) Kaiser on the farm in Warren Township, east of Bremer. On June 5, 1949 he was united in marriage to LuAnn Harms, daughter of Fred and Anna Harms of Denver at St. John Evangelical Lutheran Church – Maxfield in rural Denver by Rev. William Burrack. On May 1, 1927, Harold was baptized by the Rev. Karl Pfeiffer at St. John Evangelical and Reformed Church-Siegel rural Waverly. He attended school at Warren #5, just ½ mile west of the home farm thru the 8th grade. In March of 1940, he was confirmed by Rev. Karl Pfeiffer at St. John Evangelical and Reformed Church-Siegel. He attended Waverly High School, graduating in 1945. In June of 1945, Harold entered the U.S. Army. From January of 1946 to November of 1946, he spent with the occupational forces in Europe, stationed in Belgium. Harold was honorably discharged in November of 1946 as a Tech Sergeant. After returning home, he helped on the family farm and also helped neighbors with their farm work. After their marriage, Harold and LuAnn moved on the Art Kaiser farm and farmed there until 1954, when they bought a farm 2 miles west of there. Harold also worked at the Bremer Creamery for a year and also hauled milk for the Bremer Coop for 3 years. Harold served several terms on the Siegel Church Council and also a short term on the Bremer Coop Creamery Board. Harold spent and enjoyed the majority of his life on the farm working with his dairy cows. Around 2006, he semi-retired and devoted his time to taking care of flowers and yard work. In 2012, he retired from farming and they moved into Ledges 4 in Waverly, where he continued to enjoy his flowers, birds, squirrels and his Ledges friends. Survivors are his loving wife, LuAnn Kaiser of 66 years of Waverly, his 3 children, Charles (Debra) Kaiser of Waverly, Debra (DuWayne) Pipho of Denver and Kevin (Kimberly) Kaiser of Waverly; his 8 grandchildren, Christopher Kaiser, Kimberlee (Adam) Klein, Nathan Pipho, Matthew (Deidra) Pipho, Michael (Mica) Pipho, Travis (Lindsay) Kaiser, Katie (Tucker) Sebetka and Russell Kaiser; his 7 great-grandchildren, Brodee, Adalee, Jordee, and Gradee Klein, Ellody and Maxwell Pipho and Weston Kaiser; a sister-in-law, Janis Kaiser. He is also survived by sisters-in-law, Alita Keller, Delores (Harold) Meier, Carolyn Happel, Luella Harms and Arlyce (Oscar) Heideman, and many nieces and nephews. He was preceded in death by his parents and his brother, Elwin Kaiser on December 21, 2015. Harold enjoyed time spent with family and friends. He was very proud of his family, grandchildren and great-grandchildren. He especially enjoyed the two trips he and LuAnn took with their grandchildren to Milwaukee and Kansas City, at which time he taught his grandchildren the finer arts of bumper cars! He also enjoyed playing cards in the “500” card club and once in a while Schafskoph (Sheepshead). Funeral services will be held on Friday, February 26, 2016 at 11:00 am at St. John’s United Church of Christ – Siegel rural Waverly with Pastors Eugene Walther, Corey Smith and Nathan Pipho officiating. Burial will follow in the church cemetery. Visitation will be held on Thursday from 5:00 pm until 7:00 pm at the Kaiser-Corson Funeral Home in Waverly and also an hour prior to the service on Friday at the church. Memorials for Harold may be directed to the Kaiser family and online condolences may be left at www.kaisercorson.com. “Harold Kaiser Obituary,” Kaiser Corson Funeral Homes, Inc., accessed October 26, 2016.http://www.kaisercorson.com/obituary/Harold-Henry-Kaiser/Waverly-IA/1592624. Release Date: February 19, 2079.